Hello! Heather here with a little notions aside. I know we all have our gadgets we love and I wanted to drop in and tell you about my latest discovery – better lighting! Working on a knitting project without enough light can be a real problem. If I can't see well enough I might miss a stitch or worse yet drop a stitch. Enter my new best friend the Tenergy LED Lamp. Look at these well-lit stitches! Bright stitches! Better lighting makes for better knitting. Now, I need to be upfront here and let you know that Tenergy contacted me and asked if I'd like to try this new LED lamp because they thought it would be great for me and my fellow knitters. I don't normally do product reviews unless it's something I have tested and l would really think people would benefit from knowing more about and therefore I normally turn down offers like the one I received from Tenergy. BUT! After reading the email I realized that I already have this lamp's little sister on my desk! I use it every day and I love it. The Tenergy lamps are awesome because they have all LED panels that give the light. That means it's not a big awkward fluorescent light and it's also not hot like a traditional incandescent bulb. The light panel can give a ton of coverage without the downsides. LEDs come in a wide range of brightness and color ranges and the nice thing about these Tenergy lights is that they have a control panel that allows you adjust the brightness. That means you can use it on a really bright setting if you're working on a project during the daytime and need a bit more light or if you're working on a dark colored yarn like something with a lot of black or brown in it. You can also adjust to something a bit lower light if you're knitting in the evening or watching a movie with your honey and still want to knit but not light up the whole room. Pretty great. Pretty neat, isn't it? I use the cooler light when I really need to see my stitches and concentrate and I use a warmer setting when I just want to relax and knit. Generally speaking cooler light provides a brighter white for more clarity and a warmer light is there when you're ready to de-stress and put your feet up. All of these settings can be fine-tuned to your liking right on the touch panel. But wait -- there's more! The Tenergy Floor Lamp that I'm using in the photos is actually a 2-in-1 design. 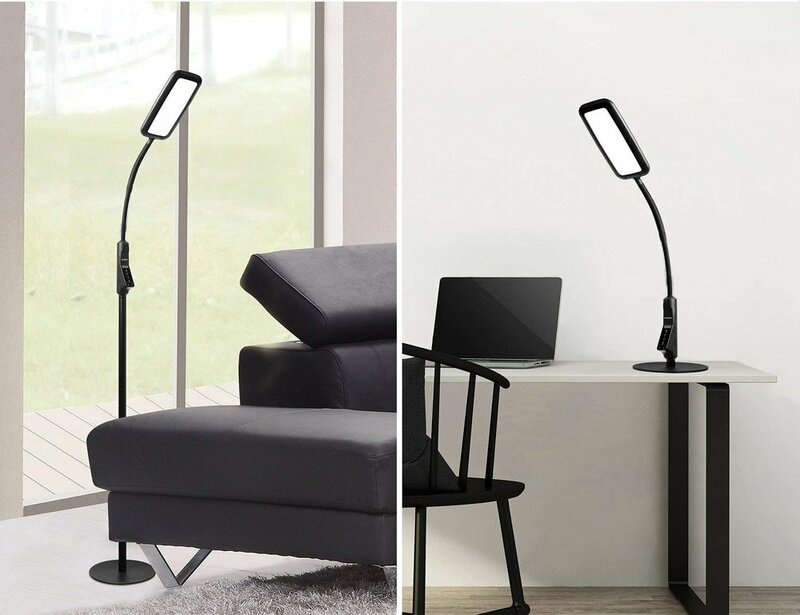 It can be converted from a floor lamp to a desk lamp in just a couple of minutes! Yes! I love that! Use the full-size lamp in the living room while you're knitting and then shorten it up to use on your craft table for quilting the next day. Genius! I'll be honest here and say that I used mine on the dining table to work a jigsaw puzzle a few weeks ago. The chandelier wasn't giving me enough detail so I adjusted this one and we taught that puzzle who was boss. I really do like this new Tenergy LED Lamp and am happy that I can share it with you because I think you'd like it, too. It makes me wonder if I would have bought that original desk lamp I have if this brilliant design had been available then? I might have just bought this version since it is double duty but definitely love that I have two now. If you need a new crafting light I am happy to recommend the Tenergy LED Floor Lamp Desk Lamp. Find it on Amazon. Amazon Affiliate links are used in this post and we may get a small share of the sale. The incredible fabric designer Betz White has put together the cutest kits for making pom poms! Her adorable Llamallooma Pom Pom Maker is bundled with a project bag, notions for making great pom poms, and one ball of Wooly Worsted yarn from Ewe Ewe. Look how awesome they are! As you know, I love pom poms and Wooly Worsted yarn makes the best pom poms! That's why Betz decided to use our yarn in her kits. There are three kit color versions available. The Green/Berry that's shown above, Navy/Pistachio below left, and Red/Indigo below right. Want to learn how to use the Llamallooma Pom Pom Maker? That's easy! Betz has created a great video on how to use the Llamallooma Pom Pom Maker using Wooly Worsted yarn and all of the great notions that come with the kits. There are findings for making keychains and zipper pulls along with the Llamallooma Llassos to make your pom poms really snug and secure. Take a look at Betz's full blog post about the kits and then order a Llamallooma Kit on her website here. So fun! Meet the Ewe Ewe Knitter's Tool Tin! This little Altoids-size tin packs a wallop of helpful knitting tools with a sweet message to "knit what you love". Let's take a peek inside and see what's in store! WHAT! Look at all of that stuff! These are straight up essential knitting notions dialed down to their best. 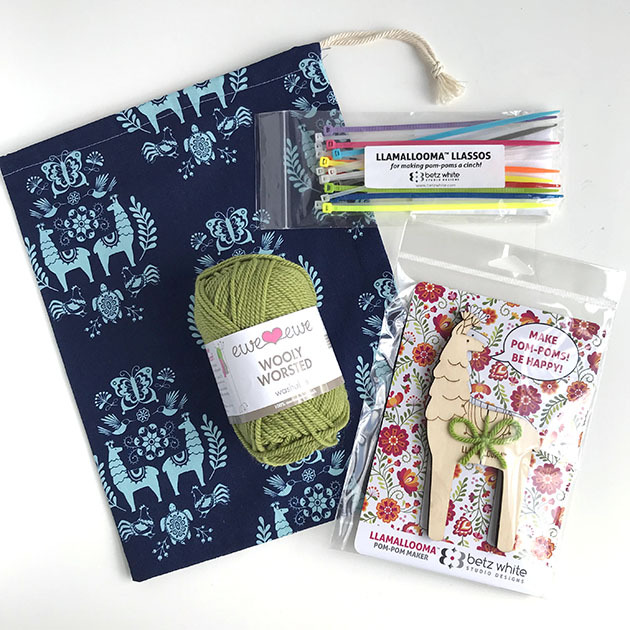 A new, avid, and even expert knitter will use all of these supplies at some point and this little tin brings it right to your fingertips because it's so easy to toss into any knitting project bag! Let's take a look at what's inside. We'll start at the top right and work our way down and counterclockwise. First we have a double-ended crochet hook that is perfect for fixing a dropped stitch. The two ends mean that it works for several weights of yarn. Next are miniature scissors to snip your yarn that pack a mighty punch! Whether it's a skinny thread to snip or a bulky wool, these sharp little scissors will do the job. Meet your new cute sheep measuring tape. This little guy comes in a variety of colors and has a retractable tape measure for checking your distance when you're on the go. To keep you on pattern, use this row counter. Also, you won't leave it at home because it doubles as a sparkly stitch marker so you can keep it right on your project! There comes a time when every knitter needs a cable needle and this one will always be there. And so will this ever-ready stitch holder. The kit includes three needles for darning and sewing. Two are sharp are perfect for adding buttons to a finished project. The third has a big eye for weaving in those finished yarn ends. Do you ever wonder what knitting needle that is sitting at the bottom of your tote bag? Wonder no more! The cute yarn ball is a wooden needle size gauge! It has US and metric sizes measuring needles US 1-11. This kit is packed with six locking stitch markers that can either sit on your needle or clip right to your work depending on what you need that day. And if all that wasn't enough, these tool tins have five handmade origami star stitch markers. Aren't they so cute! I love origami! There you have it! So much goodness packed in a little package. Get a Ewe Ewe Knitter's Tool Tin today! My knitting needles are a total mess. Seriously?? Totally. I'm a little embarrassed to say that I knit for a living and this is how I keep my tools. But, it's true. Bundles of double-points and binder clips of circulars. Until! Until now! 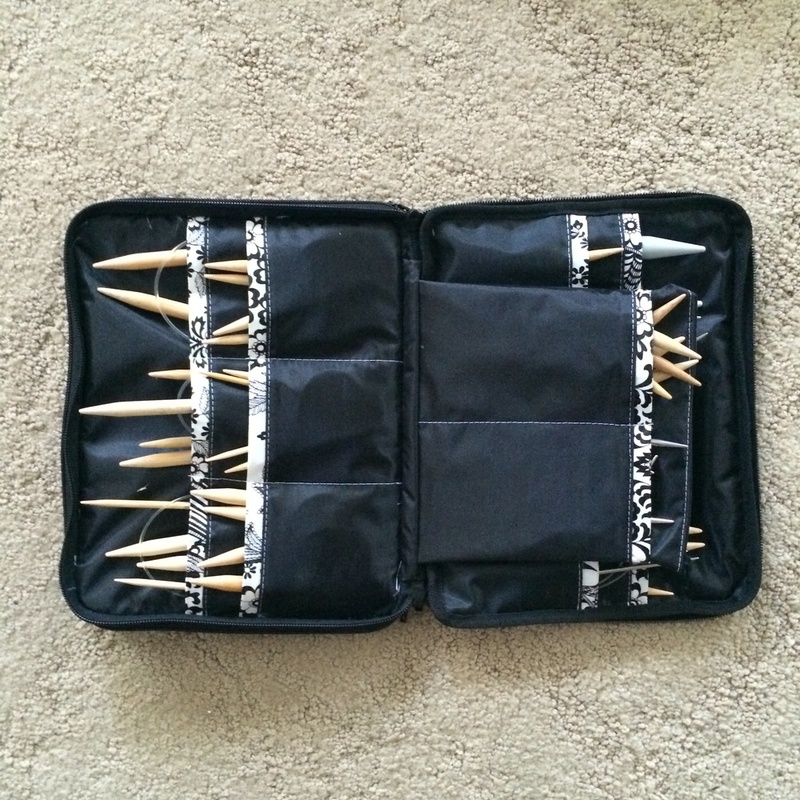 I am head over heels in love with my new Chic-a Combo Needle Case! Look at all my circular knitting needles organized so nicely. And they're all in there! But, wait. There's more! My double-pointed knitting needles are in there, too! There's more room than I have needles for which is kinda blowing my mind. BI am so happy with my new needle case. I love Chic-a bags because they're made for knitters, they're super cute and they really last. Go check out their stuff! 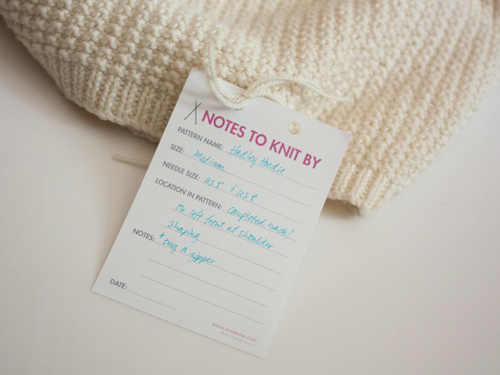 Meet our new Notes to Knit By! 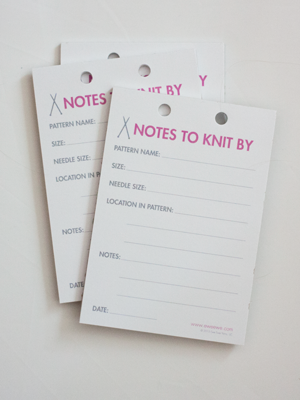 Notes to Knit By are knitting notepads specifically designed for your works in progress. Do you have a ton of WIPs? I know I do. Every good knitter does! We developed the Notes to Knit By with you in mind, never lose your place in your knitting again! Take a look. Here's how to use the Notes to Knit By and to never lose your place in your knitting again, no matter how long you hide it in the back of your closet! Pattern Name: How often does your pattern get seperated from the knitted pieces? Write down the pattern name so you can find it later. Size: What size garment you are making? Did you cast on for the 36 or the 40? The 6 month or the 12 month? Write down your size. Needle Size: Did you take your needles out and leave the stitches on a string of yarn? Yes! Write down your needle size. Location in Pattern: Where are you in the knitting pattern? Be specific! Write down the exact piece you are knitting including the row number. Notes: Then we have an extra section for notes to yourself. Do you need something extra for this pattern? Add details so you don't forget when you get back to your project. Plus! Each notepad features holes at the top of the page to tie your note right to your knitting project.